This is a thread about the company Watermelon (currently "working" on Sega Genesis / Mega Drive game Paprium, which also previously developed / published Pier Solar and published Sacred Line Genesis) and the person behind it. It's a short version of 500+ pages Paprium thread (Sega-16), SLG thread (Sega-16) and deleted discussions on MGF forums. It's made for journalists to help them covering the issue and also for people who are unaware of the situation and don't wanter to bother to read through hundreds of pages. The person in question is Gwenael Godde, the current head of Watermelon. Who is known for not paying money to contract workers, making fun of them or just ignoring. Nowadays, he behaves aggressively by default towards everyone, including investors and his most loyal fanboys (there are only two of them though). There are lots of subjective and objective things could be said about him, but the simple fact is that he is a criminal. The characters like him were seen many times before in the gamedev, but for the retro game development it's the first time to see something like this, if I'm not mistaken. Below is the list of contract workers who weren't paid for years. If you're a journalist, you can contact each through here or through Twitter for additional details if you need to. Or you can't just ask people around. This is not a full list, something was lost because there are too many messages to dig through. If you're a worker reading this thread and you weren't paid when promised or had a contract, write about it here. Godde paid the first part in the very beginning, then ignored all messages about paying the second. 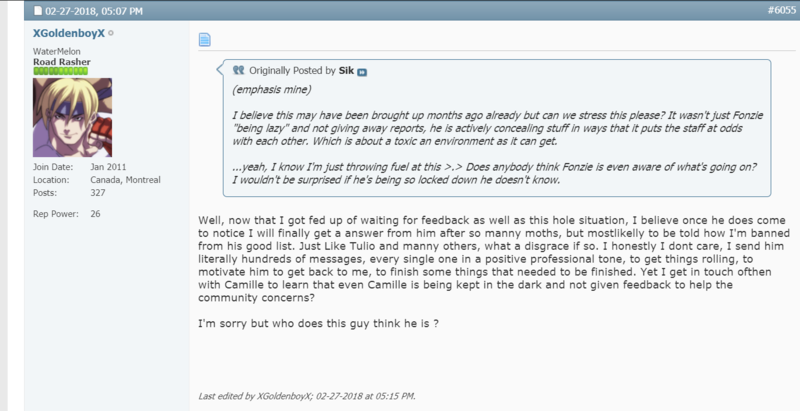 He paid the second one only after I brought the subject to the public on Sega-16 and MGF Forums and compiled a long report with e-mail screenshots (which was approved for publication by WM's Representative Zebbe), which I was going to publish. Then he told he will pay the rest through PayPal, but weeks after he mockingly stated he just won't be doing that. Not a single sales report was provided since SLG launch by him as well. Paid partially. He was getting payments but then they stopped and he just left the project. It wasn't touched since 2015. Screenshot: Can't find the quote, but it was mentioned in the Paprium thread on Sega-16. The former president of Watermelon, according to him he was removed from Paprium credits for his work on Paprium. 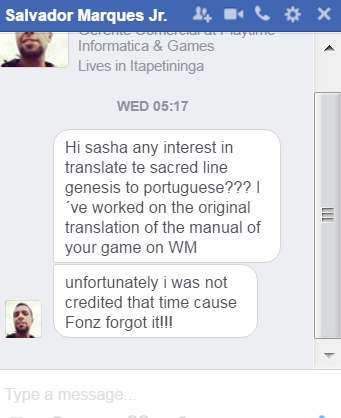 Watermelon Portuguese Translator, wasn't even mentioned in the credits. Whole blog dedicated to Godde's lies about Paprium. It's already a meme in France. I hope I've got it all right. Share it with the gaming websites you know, especially the ones who were promoting Paprium and its trailer back in 2017. It also could be made sticky, but that's up to moderators. Last edited by sashadarko; 04-12-2018 at 07:50 AM. Btw, that Paprium Fiasco blog smells like Fonzie. To me is just another way of him teasing people about the game. His marketing book is quite weird. You may want to try sharing this info with someone like Larry Bundy Jr. He covers a lot of crowdfunding scams in detail in his "Kickscammers" series. Read between the lines, it's hyping up the game. A lot of the criticism is saying that it can't be done, that it looks too good, that it has too many sound channels etc. Plus, who is going to make a blog about a vaporware title? If it was some frustrated ex dev, I'd expect to see post after post about how they didn't get their money, screenshots of unpaid invoices, stuff like that. I just checked out that blog. 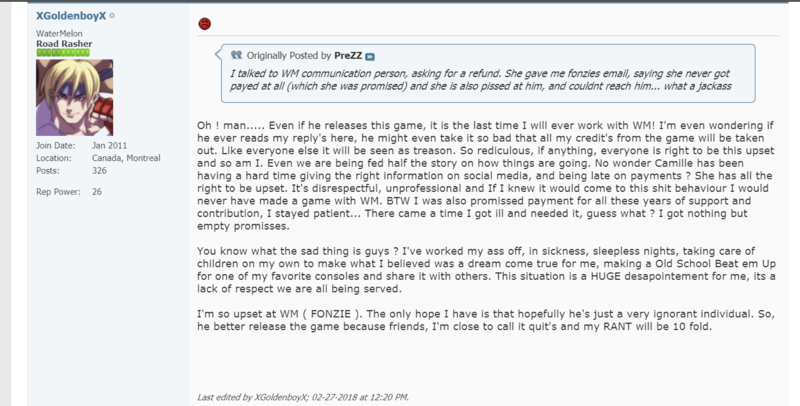 Aside from the other posts that seem to mock everyone critical of Fonzie, the "doctored" screenshot post was extra dubious. Post a few 320 x 224 screenshots that are clear enough to see the level of shading and color. Show a bit of motion blur so that no one can say that they're just still mockups. I understand that you're upset, but we really don't need a separate thread for this. This discussion has beem going on for some time already in the Paprium thread. We can keep it there.